Sweet corn is a different variety – a mutation in fact – from the ancient maize that was grown across the Americas. Native Americans exploited this mutation and began serving corn as a vegetable when it had previously only been used in its dried form as a cereal. It is reputed to be high in anti-oxidants and, as native Americans soon found out, when combined with beans it provides a nutritionally complete meal. With corn in season at the moment I am always looking for different ways to serve it. I always buy my corn in the husk and if it is really fresh, it needs little more than a quick boil, a bit of salt, pepper and butter and it is ready to be eaten. Corn on the cob can, however, seem a little boring after a while which is why I make corn salsa* and corn fritters. 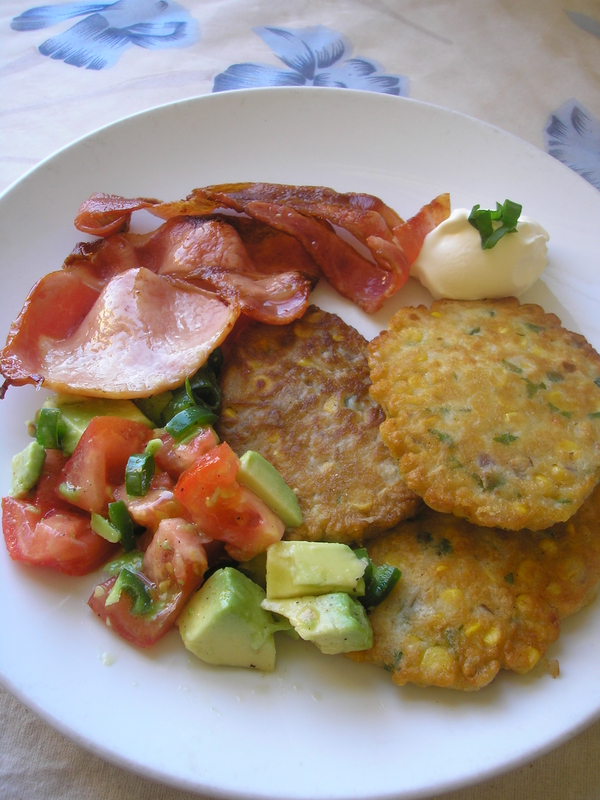 Luke Nguyen’s prawn and corn fritters that I cooked in May 2011** were more of a deep fried fritter, these ones are simpler and are more like corn pikelets or hotcakes. They are delicious served with crisp grilled bacon for breakfast but they can be eaten at any time of day. Sift flours and salt into a large bowl. Make a well in the center and add the two eggs. Add the milk and mix until you have a fairly smooth batter. Add onion, chillies, corn kernels, coriander and seasoning. Rest mixture in the refrigerator for 1/2 an hour. Heat a heavy based frying pan and add a little oil and butter. When hot add the corn mixture in spoonfuls. Cook on both sides until golden brown. Drain on a rack. Some say that people will eat anything if it is crumbed and deep fried. This may be true but only if the diner doesn’t know what is inside. I was once served crumbed lambs’ brains by my practical joker of a mother. Along with my brother and sister I did eat them because I didn’t know what they were. Mum told us we were having schnitzels for dinner and added that she had a surprise for us when we had eaten all that was on our plates. I remember being suspicious of the soft texture of the ‘schnitzels’ but I still ate them being a kid and fond of surprises. Of course, Mum’s surprise was to tell us we had just eaten lambs’ brains. At least she got a good laugh though we didn’t think her little joke was funny. Lambs’ brains do not have a place in my kitchen though I do concede that some people like them. Instead I like to crumb free range chicken or seafood. I prefer to use Japanese panko breadcrumbs as they produce a crispier result – they are available in most supermarkets these days or try your local Asian grocer. Deep frying is apparently healthier that shallow frying as long as you have the oil hot enough to seal the crumbed coating. This time I made little gremolata crumbed chicken morsels that can be served as a meal or as finger food. They are good accompanied by grilled capsicum mayonnaise. Cut chicken into bite sized pieces. In a large bowl mix together your breadcrumbs, parsley, lemon zest and minced garlic. Place flour on a plate and season with salt and pepper. Place your egg wash in a bowl. 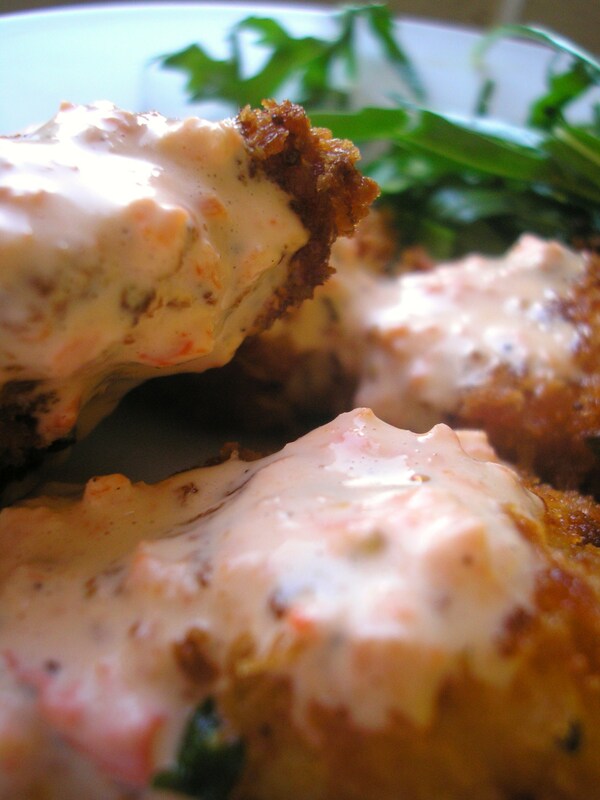 Dredge your chicken pieces in flour, dip in the egg wash, then the breadcrumbs. Make sure they are well coated. Refrigerate 1 hour to ‘set’ the crumb. Heat 2 cups sunflower oil in a large saucepan or wok. The oil is hot enough when bubbles form around the handle of a wooden spoon that is dipped in. Gently fry the chicken morsels until golden brown all over – I regulate the temperature of the oil by adding or removing the food. Drain on a wire rack over a tray and finish for 10 mins in a 180c oven. To make the mayonnaise – mix the grilled capsicum puree with the mayonnaise, season with salt, pepper and a squeeze of lemon juice. It is hard to imagine how cooks throughout the centuries would have fared had they not had the common onion to flavour their dishes. Many dishes around the world begin with onion gently fried in oil or butter – these include soups, stews, casseroles and sauces. European peasants, in particular, would have eaten some very plain food if they had been deprived of onions as a seasoning. Onions are very versatile and can be pickled, fried, baked, stuffed or caramelised. Onions have unique health giving properties and are said to contain antioxidants, anti-inflammatories, they can help lower cholesterol and they are said to be useful against osteoporosis, particularly when women are at the highest risk – during menopause. When onions are cooked down slowly in some oil and butter they become sweet. The addition of a couple of bay leaves, some sugar and a little balsamic vinegar, combined with further cooking down, gives a lovely caremelised result. These can be used as a base for various tarts and pizzas, or on homemade burgers. 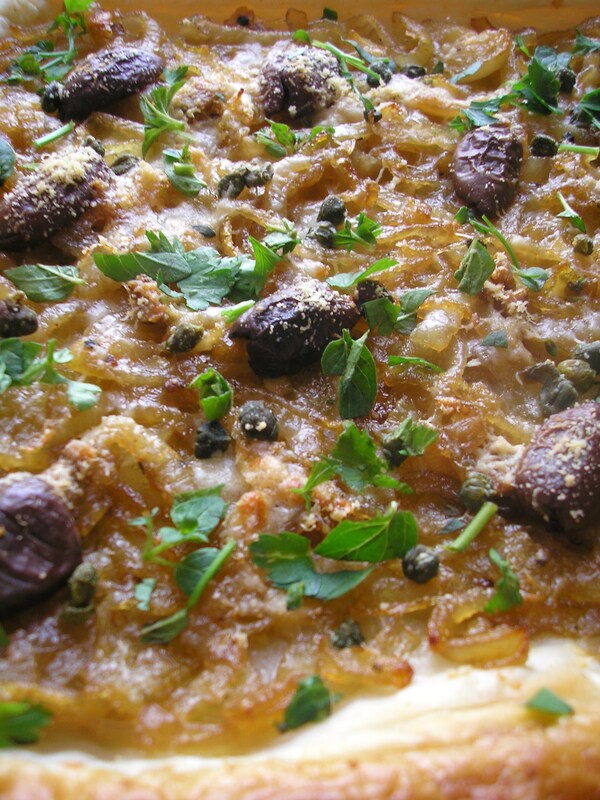 The French classic, pissaladiere, combines a pastry base spread with caramelised onions, topped with a diamond pattern of anchovies, studded with olives and baked. I make a number of variations on this classic recipe – with less anchovy and sprinkled with freshly grated Parmesan cheese and chopped capers or you can omit the olives and anchovies and top it with crumbled feta instead. 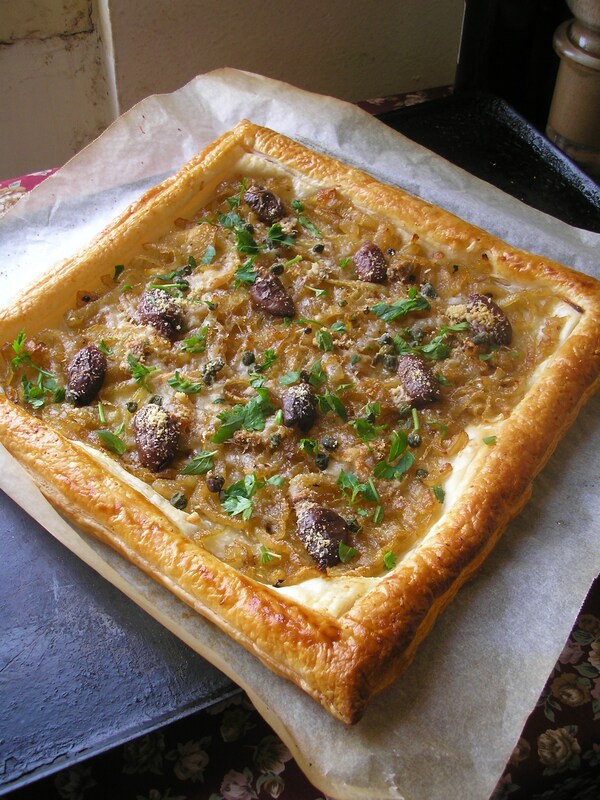 If you have frozen puff pastry sheets available these tarts make a quick lunch or snack and can be made from ingredients to hand. an assortment of toppings to be used in your favourite combo – anchovies, capers, feta, Parmesan etc. Heat oil and butter in a heavy based pan, add sliced onions and bay leaves. Fry until translucent. Reduce heat and add sugar, balsamic and a tbs of water. Allow the onions to cook gently for 30 mins stirring occasionally and adding a little more water if the onions are sticking. The finished result should be pale brown. Thaw pastry sheets and score around the edges. Spread 1/3 of the cooled onion on each base, inside the scoring. Top with your chosen toppings. Brush egg around the edges and bake 15 mins in a pre-heated 220c oven. Reduce heat to 180c and cook for a further 15-20 mins or until the pastry is golden brown. I’ve been reading a number of books about Italian cooking recently. It seems pasta was and still is a basic foodstuff in most parts of Italy. That other Italian staple, polenta, was originally only eaten in the northern parts of Italy but it has spread and is now often served as a cheap and delicious alternative to pasta on Italian tables throughout the country. I like my polenta with lots of cheese, butter and herbs stirred in at the end. It is even better if poured into a lined baking dish and left to set, then finished with more cheese and baked in the oven. 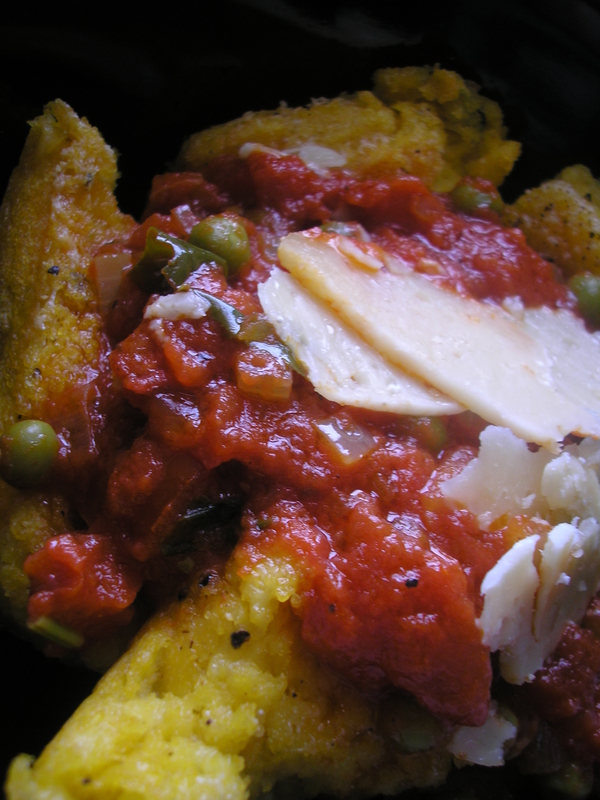 When serving polenta I prefer to keep the sauce light as the polenta itself is heavy enough. One of the books I have been reading is The Sicilian Kitchen by Brisbane born Michele Di’ Bartolo. This book is as much a memoir as it is a cookbook. The Brisbane suburb of West End, where Di’ Bartolo spent much of her time with her Nonna, appears to have been a melting pot of various ethnicities, frozen in time from the moment they left the ‘old country’. Di’ Bartolo’s Nonna and her parents are Sicilian so this was the culture in which she was raised even though she was Australian born. Like many cultures, food plays an enormous part in both daily life and special occasions. By all accounts, life in Sicily was hard – the rocky terrain, the damage wrought by centuries of invasion and conquest, the relative isolation from other parts of Italy, all of these factors played a part. The average Sicilian was often compelled to stick to a fairly simple diet merely because the options were so limited. In some cases though, simplicity turns out of be sublime as was the case with the Sarsa Semplice (literally simple sauce) that I made to go with my polenta. Heat the olive oil in a large, heavy based pan. Add the onion and garlic and fry until translucent. Add the basil leaves, frozen peas and paprika (if using) and cook for 1 min. Add the tomatoes, season to taste and simmer over low heat for 30 mins, stirring frequently. Serve over pasta or polenta. Cook polenta according to the directions on the packet. There are two basic types of polenta – the ‘quick’ one takes about 5-10 mins to cook, the traditional one, about 30-40 mins. It’s your choice but whichever one you are using you need to stir frequently as polenta loves to stick to the bottom of the pot. When polenta is ready stir in 3/4 of the Parmesan cheese, 1/2 of the butter and the chopped basil, season to taste. Pour into a lined baking dish and sprinkle the remaining cheese on the top. Dot with the remaining butter and bake in a 180c oven for 30-35 mins or until the top is lightly brown and the edges a bit crispy. Serve with your favourite sauce.